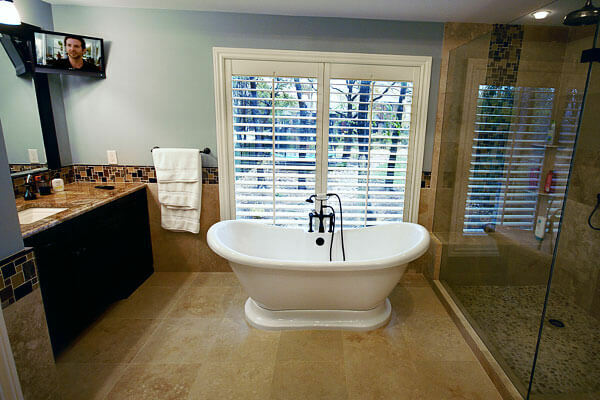 At Records Custom Cabinets, we’ve designed and built some of the most amazing bathrooms in the Wichita area! Our luxury bath cabinetry is breathtaking, beautiful, highly functional, and designed to last a lifetime. From a simple maple vanity with bun feet to the most elaborately adorned walnut cabinetry ensemble with carved columns, we can make the bathroom of your dreams a reality! We use our extensive knowledge of the latest trends, design styles and innovative components to design bathrooms that spark an emotion. Whether you desire a contemporary bathroom with simple lines, or a traditional styled bathroom with beautiful crown molding and mitered cabinet doors, our experts can design a room that exceeds your greatest expectations! Additionally, since all our bathroom cabinetry is hand built, you get a superior product that is made to fit perfectly in your space. Want a vanity that’s taller, shorter or deeper than the standard? How about a wall of mirrors with hidden medicine cabinets behind? 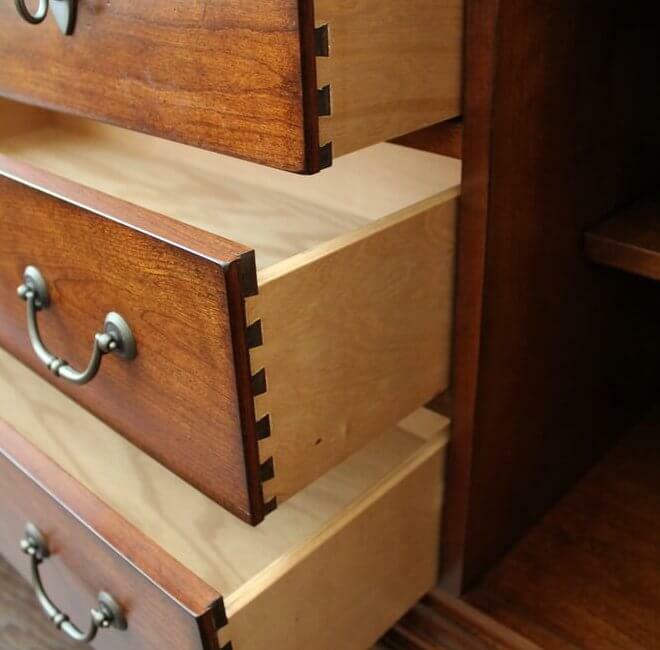 Maybe deeper than standard drawers or fancy mirror frames that tie in seamlessly with your new cabinetry? Whatever you’re heart desires, we can accommodate you! 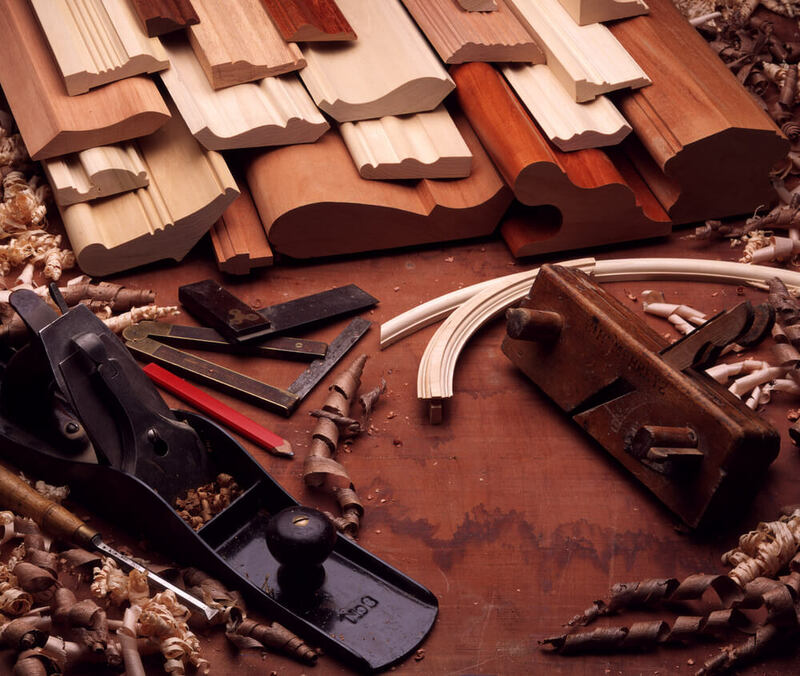 Once your design is approved, our talented craftsmen build your custom bath cabinetry to precise specifications using the highest quality lumber and components. To begin, your casework is carefully cut and drilled using highly accurate, specialized CNC equipment. Each cabinet box is assembled by hand and each joint is securely nailed and screwed together for superior strength (We don’t use hot glue to hold our cabinets together like the other guys!). Next, each piece of wood for the frame of the cabinet and the doors is hand selected and matched for consistency, beauty and character. The cabinet frame is then assembled by hand and joined together with advanced joinery methods. Finally, the cabinet frame is merged with the cabinet box and our muti-stage sanding and finishing process begins. Once complete, our custom built bath cabinetry is ready to send to the jobsite for installation and final assembly. Finally, after installation, we install the soft closing premium drawer guides, soft closing hinges, doors and drawer fronts. By installing the drawers and doors last, we reduce the risk of damage to the doors and drawer fronts during the cabinet installation process, insuring you a flawless finished product. 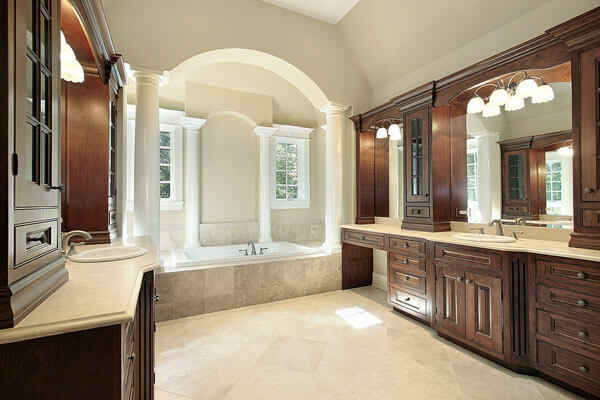 Our fine custom built bathroom cabinetry is beautiful, handmade and built to last a lifetime. 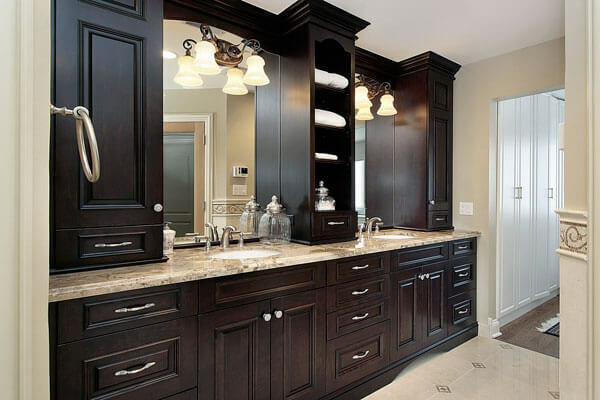 At Records Custom Cabinets and Trim, we take great pride in our ability to take your custom bathroom cabinetry from concept and 3D design, all the way through custom cabinet construction, installation and finishing. Our “hands on” approach minimizes delays in the construction process and helps to insure that our strict quality standards are met on each and every job. We build all of custom bath cabinetry by hand right here in Wichita, Ks, and we can integrate a wide variety of specialized bathroom storage solutions. From pull-out hampers to drawers with built in cosmetic organizers, we can accessorize your cabinetry with all the latest gadgetry and components. Solid wood dovetailed drawers, roll out shelves, jewelry drawers, medicine cabinets, stool cabinets and beautiful tub decks are just a few more of the custom touches we can build into the bathroom of your dreams. The combination of our first class service, exceptional design, quality components and extraordinary value, yield a custom bathroom that looks as good as it functions! 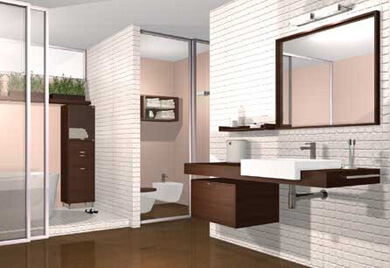 Having a hard time picturing what your new or remodeled bathroom might look like? 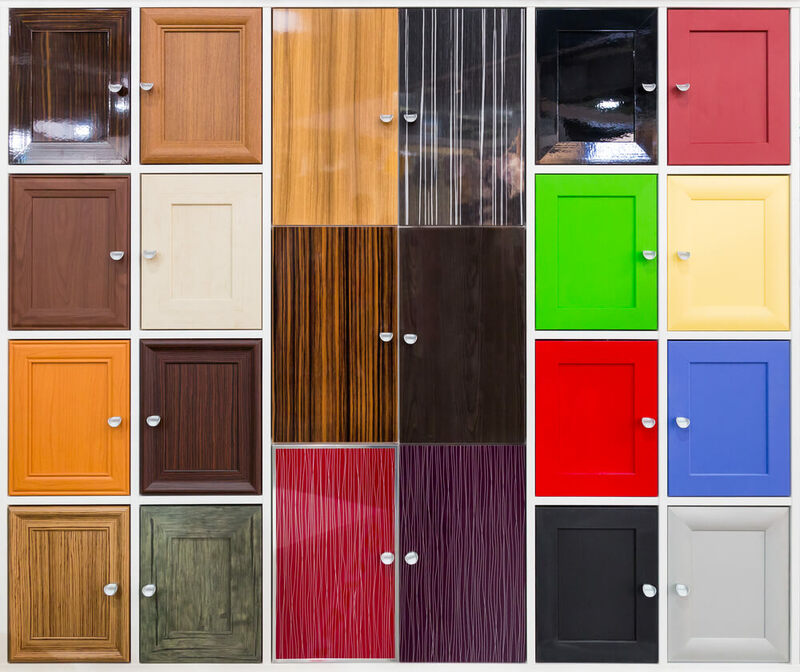 Not sure if your new custom built cabinets would look better in oak, birch or walnut? 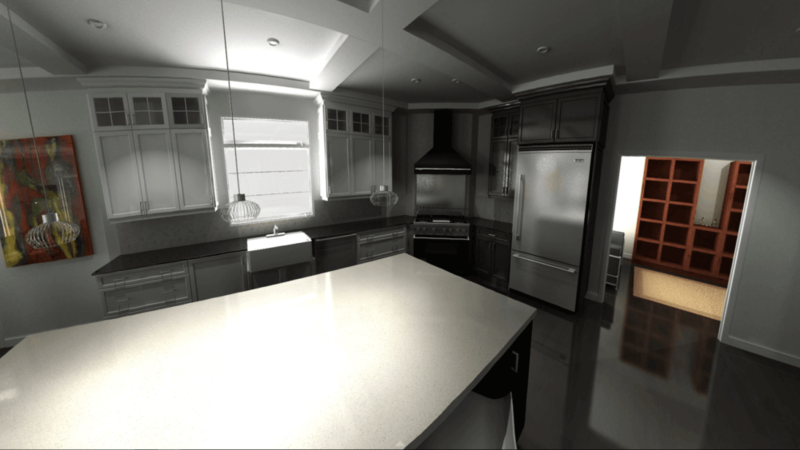 Our 3D computerized design service can help! 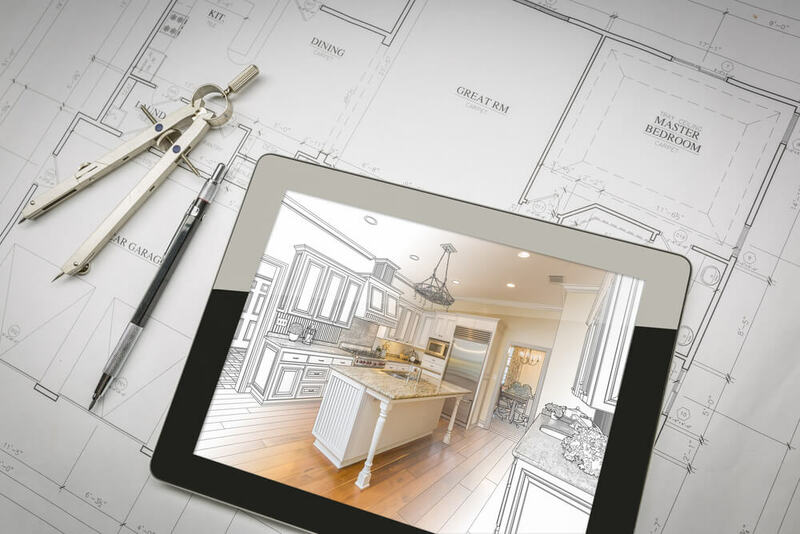 We can design your custom kitchen cabinetry with our cutting edge software and depict your custom vanity cabinets, toilet topper, medicine cabinets and custom tub deck virtually, allowing you to see an accurate representation of the finished product before the first piece of lumber is even cut! If you are building a new home or desire the very best quality for your bathroom remodel in the Greater Wichita Area, call us today at (316)733-6800 or contact us online for a no cost, no pressure in home consultation.